on 30 september this year, were he still alive, drummer buddy rich would have been 100 years old. unfortunately, buddy died at the age of 69 in april of 1987, the very year that mrs washingmachinepost and i moved lock stock and barrel to the southern hebrides. i had attended a 1984 concert by the buddy rich big band in glasgow, though my father and i were sat so far from the stage, it was all but impossible to closely watch the man's impressive percussive technique. however, not only for yours truly, but for drummers all acros the world, there will never be anyone greater than rich, despite all the stories relating to his apparently common fits of bad temper. i don't mind admitting that the larger of my two drumsets was purposely purchased with a covering of vintage marine pearl and in similar sizes to those played by buddy rich. if only i had possession of even a tenth of his ability. but aside from owning a similarly constituted drumset and more than just a few recordings and dvds, that rarely seems enough to confirm my own fandom, even if, up till now, it was something i kept largely to myself. only the other day, i discovered that vic firth drumsticks have issued a commemorative pair of buddy rich sticks, presumably so that others as endeared as yours truly, might order a pair in celebration of the upcoming anniversary. because sometimes you just need that little tangible extra. a similar state of affairs no doubt exists amongst certain cyclists for whom three weeks of french france is clearly insufficient to scratch that itch. 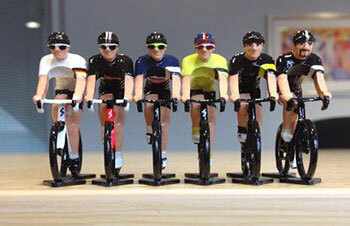 aside from replica team strips and carbon fibre waaay outside our feeble demands, to politely demonstrate to any visitors who may happen to drop by unannounced, there is little better than a peloton of tiny hand-painted cyclists on the sitting room mantlepiece. such diminutive items are readily available from a variety of sources, but for the true connoisseur, nothing less than a custom painted figure will suffice, the sort of craftsmanship available from rowland haverly, who trades as rowleyrides at rovelo.cc. i first came across these at the rouleur classic last november and the memory was jogged during a recent visit to rapha's brewer street cycle club. 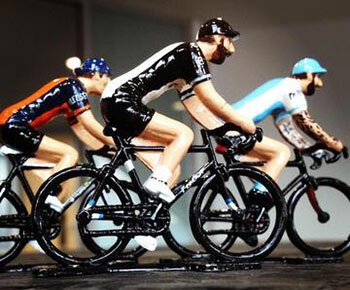 the painting of these figures was sophisticated to the extent that i was moved to ask rowley how long he'd been painting model cyclists? "I think its about seven years now. I did have a bit of a break as I was selling them on eBay in the early days and that became disheartening. I then started to use Instagram as my 'shop window' and it started to pick up from there. I now feel very lucky that I receive orders from all over the world for my little chaps. It certainly gives me a lot more job satisfaction than my day job!" though i spent my later teenage years at art college, where creativity was allegedly valued, i still infrequently enjoy colouring books and at one time, those painting by numbers sets, even though the end results looked a tad bizarre at times. 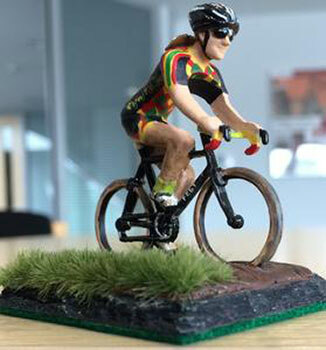 however, though the art of painting tiny metal cyclists on bicycles might seem like a miniature industrial exercise, is rowley of a naturally artistic disposition, or is that not really part of the job description? "I always used to enjoy art and drawing when I was younger, but after I left school, I left it behind. It was the feeling of the need to start doing something arty againÊthat led me to painting the figures. It's a shame that, as we 'grow up,' we stop doing the things we loved as a child." it's quite possible that, in answer to rowley's last statement, we tend to view those childhood pastimes in the manner that an adult views his/her hobbies. a hobby should, if it's to fulfil its full value, be something that lowers stress, increases enjoyment and offers little or no pressure on available time. if it takes nine months to put a fignon replica raleigh together, so be it. in rowley's case, are those magnificently painted little cyclists something that developed from a hobby, or was commerce the object from the outset? "I initially ordered 30 figures from the forgery in France with the idea of painting a few for myself and gifting a few to friends. After thatÊI painted up a few in the style of Rapha and Merckx etc and it took off from there. It is now definitely a second full-time job and I have a two month waiting list to try and keep on top of." 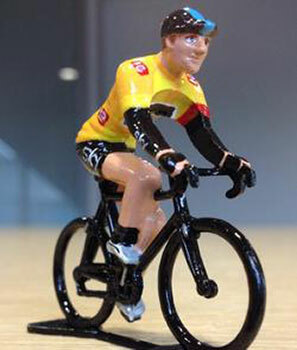 as i intimated above, if you're happy to have the mantlepiece decorated with what might be termed generic cycling figures as do i, there are a number of retail outlets and ebay sites more than happy to supply your demands. however, should you perhaps wish something a little more specialised, a cyclist painted in retro team kit or a more personalised specimen, the field narrows considerably. however, i'd have been inclined to think it more likely that the latter would form a small part of rowley's daily output. does he, therefore, offer any generic painted models or is it a case of commissions only? "It is most definitely commissions only these days and most peopleÊrequest a mini version of themselves on their bike in their club kit etc., whick keeps things fresh and interesting. There are only so many timesÊyou can paint hoops around Peter Sagan'sÊWorld Champs jersey before the novelty wears off.ÊI rarely get the time to build up stocks and if I do, they are usually allocated to the Rouleur Classic show at which I have been lucky enough to exhibit for the last two years. 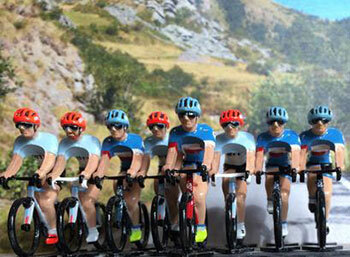 So I try to get some Eddy Merckx, Roger de Vlaeminck, Wiggins, Froome and Sagan figures setup, as they are always the most popular." having discovered only recently that there are smartphone apps that allow a few 21st century businesses to offer flatpack flower bouquets through your letterbox (yes, really), if there was ever any doubt that we live in the age of instant gratification, that knowledge dispelled the last vestiges of belief. painting little metal figures is probably not something that can be instantly delivered after clicking an app and a quick perusal of the rovelo.cc website will inform those intent on owning their very own miniature verisimilitude, that rowley currently has a waiting list of two - three months. is that as a result of the time it takes, or because he's painstakingly patient. "I guess each figure takes on average about a week. More complex designs take longer, as I have to wait for the paint to dry overnight before moving onto the next stage. I have had a lot more requests for female cyclists recently and they take a little longer, what with modelling and painting the hair etc." when i had notions of being an artist, there was always the scary notion that a commission might be beyond my capabilities, or that the end result would prove less than satisfactory to those responsible for the commission. sadly, an artistic career failed to last long enough to find out. however, has rowley received any commissions that have provided more difficulty than most? "Lord Horatio Nelson on a bike was probably my trickiest, one which I made for the organisers of the Trafalgar Way sportive. 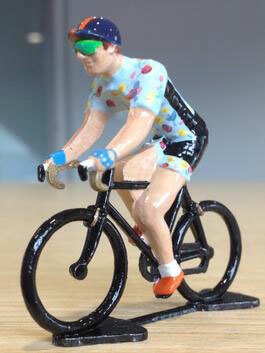 And my occasional series of Bowie on a Bike, which I do for myself, are always a challenge. Others have been the larger bulkÊorders from clubsÊand manufacturersÊetc., which usually have a tight time schedule and where I have had to put in some late nights and swollen anklesÊto complete." if i might briefly return to the drumming metaphor with which i opened, those of us intent on presenting a competent face to the music-loving public spend more than a few hours each day practising our art in order that any percussive demands are less than our ability to cope. in other words 'headroom'. in order to be good, you've got to be better than good. in rowley's case, does this mean he has had to become well-versed in the history of cycle sport to ensure accuracy of design? "I guess it helps, but no-one has asked for anyone too obscure. I did make a diorama of all the teams that took part in the 1971 Tour de France and there were two or three teams on which it was very difficult to find info. I got there in the end, but for a while it looked like the project might falter due to a lack of available info. I guess some teams only exist for a year before sponsorships change. In general, all jerseys evolve on a yearly basis, so they often take a bit of research to get the finer details correct." i have a notion that cycling is one of those activities for which you'd have to hold enthusiasm before becoming involved on such a minute scale. i'd be very unlikely to spend as many hours as i do writing the post if my real joy in like was a good game of golf (a little hebridean humour there; a good game of golf indeed). it therefore seems not too inappropriate to ask rowley if he's a cyclist in real life? "I try to be. At the moment it's reserved for the odd commute and a Sunday morning. Having a young family and a day time job along with the figure painting, means times is precious. It's a sign of the times that I would rather fill my free social time cycling with friends than sitting in a pub with them."